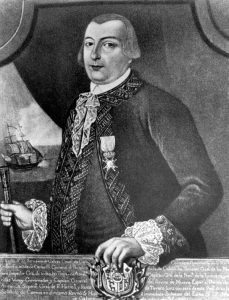 Bernardo de Gálvez, Spanish governor of Louisiana and unsung hero of the American Revolution, was born on July 23, 1746, in Macharaviaya, Spain. Following in his father’s footsteps, Gálvez chose a military career that quickly found him colonel of the Louisiana Regiment after years helping Spain fight Portugal and Apaches in New Spain. During the early stages of the American Revolution, Gálvez supplied patriots with arms and supplies, becoming an active ally. Once Juan Carlos III declared war on Great Britain in 1779, Gálvez, after direct communication with Patrick Henry and Thomas Jefferson, soon became a more enthusiastic participant, helping the patriots by securing the port of New Orleans and defeating the British at Mobile, Alabama and Natchez, Mississippi. One of the most important defeats against the British came after a two-month siege on the capital of West Florida, what is known today as, Pensacola. Great Britain’s defeat at the Battle of Pensacola eventually secured Spain’s control of East and West Florida in 1783 and ultimately ensured Gálvez’s reputation throughout parts of Europe and the Americas. Gálvez’s poem, from a rare copy graciously provided by the Library of Congress, is translated into English for the first time by Jonathan Tharin as “The Triumphant Victory at Pensacola.” Gálvez creates a two-part ode glorifying the defeat of the British by his Spanish forces and the subsequent celebration of their victory. Upon returning to Spain, Gálvez was given a royal commendation, named governor of Florida, and eventually given the title of viceroy of New Spain after the death of his father. In honor of his role during the American Revolution, Congress finally fulfilled their promise made 232 years earlier by hanging his portrait in the Senate Foreign Relations Committee room in the Capitol. Baker, Maury and Margaret Bissler Haas. 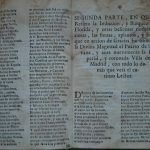 “Bernardo De Gálvez’s Combat Diary for the Battle of Pensacola.” Florida Historical Quarterly 56:2 (1977): 176-99. Mitchell, Barbara. “America’s Spanish Savior: Bernardo De Galvez Marches to Rescue the Colonies.” MHQ 23:1 (2010): 98-104. Washington, George. The Writings of George Washington. Ed. Jared Sparks. Harper, 1847. Gálvez, Bernardo De. Recordado en Washington. Málaga: Biblioteca Virtual de la Provincia de Málaga, 1971. 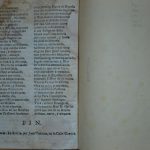 Noteworthy, True, Triumphant, and Victorious Report that declares, and gives news of the happy victory, and victorious applause had by the Catholic Armies of our August Monarch the Lord Charles the Third (God Save Him) in the restoration of the Site of Pensacola, Florida, and other different lands that the Spanish Crown goes restoring from the British King, all obtained at the request and care of the Most Excellent Sirs Mr. Josef Solano, General of the Sea, and Mr. Bernardo Galvez, General of the Land as occurred the 8th day of May of 1781, with all else that will be seen curious in this First Part. I will follow the System. in good or bad fortune. 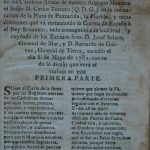 Second Part, relating the Invasion and Blockade of Florida, and other curious warlike news: the festivals, ovations, and celebrations that in Thanksgiving have been offered to the Divine Majesty of the Port of Havana, and again now the Imperial, and crowned Town of Madrid, with all the rest that will be seen by the curious Reader. to our undefeated King Charles. having God on her side. With permission: In Sevilla, by Josef Padrino, on Genova Street.